I would like to invite everyone to come to The Intuitive Arts Festival this weekend at the Millennium Maxwell House Hotel in Nashville, Tennessee. My Spiritual Family at New Life Spiritual Center is sponsoring this event and I am so excited and honored to make this my first official signing. 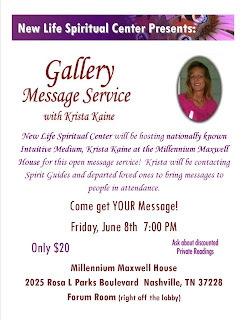 We will start this event with a Gallery Message Spirit with Krista Kaine tonight at 7 pm. It is only $20 to attend this event. 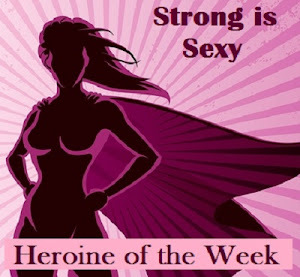 Krista is an incredible psychic and medium who will amaze you with her gifts. She will be contacting Spirit Guides and departed loved ones to bring messages to those in attendance. Krista is the real deal and I promise you will not be disappointed. Get there early and be prepared to be blown away by the message the Spirit will give to you. 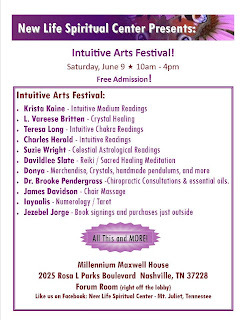 The Intuitive Arts Festival is tomorrow from 10 am to 4 pm. Krista will be doing intuitive readings. My friend Teresa Long will be doing Intuitive Chakra Readings. Reiki Master Davidlee Slate will be offering Reiki and Sacred Healing Meditation. 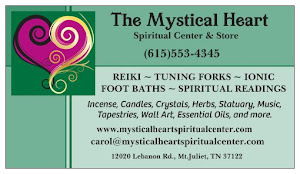 We will also have guests vendors from Cosmic Connections as well Astrological Readings, Crystal Healings, Chiropractic Consultations, Chair Massage, Numerology and Tarot Reading. I will be at the entrance with print copies of all of my books available for personal signings with perhaps a message from my Spirit Guide Odessa. I'll be offering a free ebook and discounts on downloading my other books if you get a print copy. I'll also have CDs with my complete Ring Dreams series and bonus short stories available in .pdf and .epub format or .pdf and .mobi format for only $7. 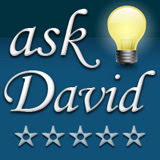 You can transfer the files from your computer to any ereading device or download a free Kindle or Nook Reading application. The .pdf files will work on any device with Adobe Reader. I'll also have QR Codes you can scan to buy my ebooks with one click on your iPhone or Android device. 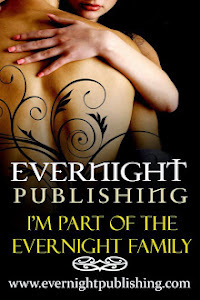 Two of my books, Infinity and Desire are part of the Book Lovers Buffet featuring over 150 .99 ebooks in every romance genre. The sale starts today and goes through the 22nd. I'm also set up for Kindlegraphs where Odessa might just send a special message straight to your Kindle. This event is free and has a little something for everyone. I hope you will come and join us in the special celebration of Spirit. If you can't be at the event and would like to order one of my Ring Dreams CDs they are only $10 including shipping or $7 emailed to you as a zip file in the format of your choice. Just email me at jezebeljorge(at)gmail.com for all the details.